Spring is almost here...officially, Sunday March 20th marks the Vernal Equinox. Coinciding, but not coincidentally, with the Vernal Equinox is Scarlet Elfcup's birth date! Yes, friends, on Sunday, March 20th Scarlet Elfcup will turn two! There is much to be celebrated in the second year of life. But, don't let me spoil the fun just yet. Instead, let me tell you that the bears and the bunnies have come out from hibernation to jumpstart the festivities that Spring has to offer. Kordee measures slightly less than 8" (20 cm) long. This lovely textured bear is made with all natural materials. Kordee is made with 100% cotton corduroy. Kordee's ears, hands and feet are lined with a beautiful 100% Japanese Echino cotton linen fabric. Kordee is stuffed with 100% clean carded wool. His eyes and nose are embroidered with 100% cotton embroidery floss. 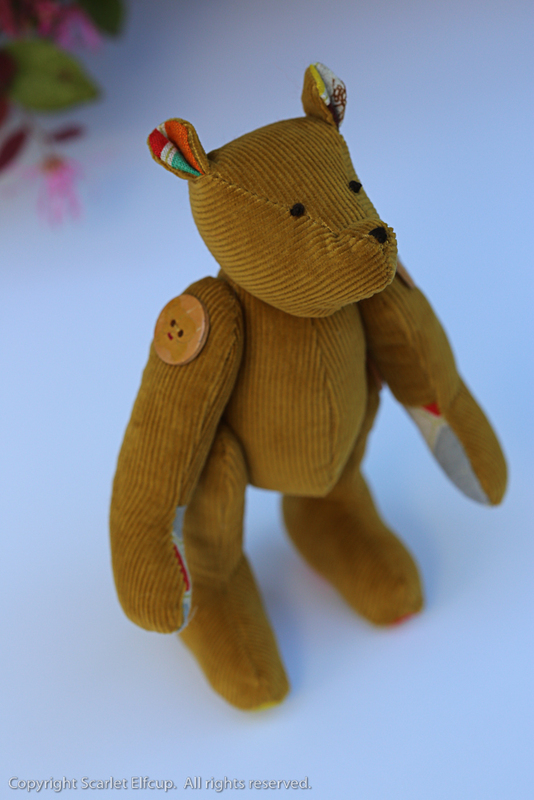 His arms and legs are string jointed and stabilized and strengthened with beautiful vintage wooden buttons. Kordee comes dressed accordingly for the occasion whilst wearing a hand knit bunny bonnet. His tangerine bonnet is hand knit with a 50% wool / 50% alpaca yarn by Isager. 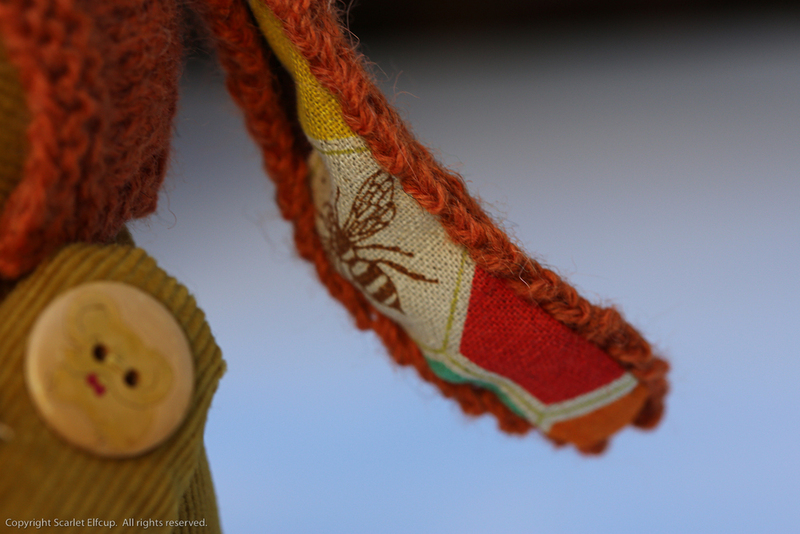 The ears are lined with the same fabric as that on his ears, hands and feet. Kordee comes bearing a nest full of tiny eggs which he found on the forest floor while scavenging for nuts and berries. The nest measures 3" (7.6 cm) in diameter and less than 1" (2.5 cm) tall and is crocheted with strips of 100% Japanese cotton linen fabric , made from the same material as that lining his ears, paws and feet. 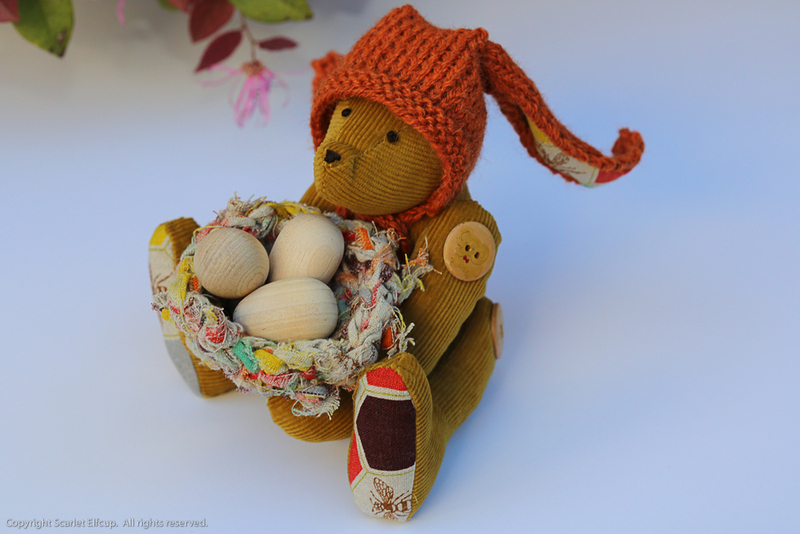 The three small wooden eggs each measure a little over 1" (2.5 cm) tall and are left unfinished and undecorated so that you can have the pleasure of decorating them with baby bear, Kordee, over Easter. Carmina measures approximately 8" (20 cm) long. 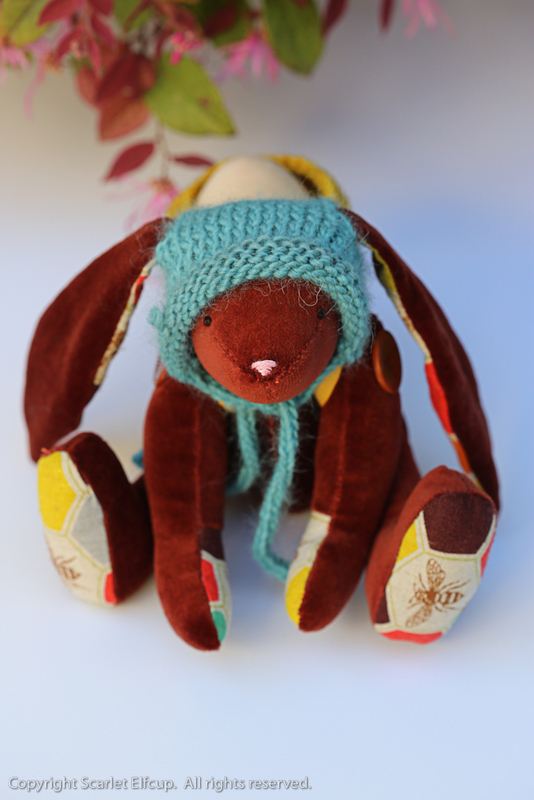 This luxurious velveteen bunny is made with all natural materials. Carmina is made with premium quality 100% cotton velvet. When you hold her, you will know how ultra soft she feels. 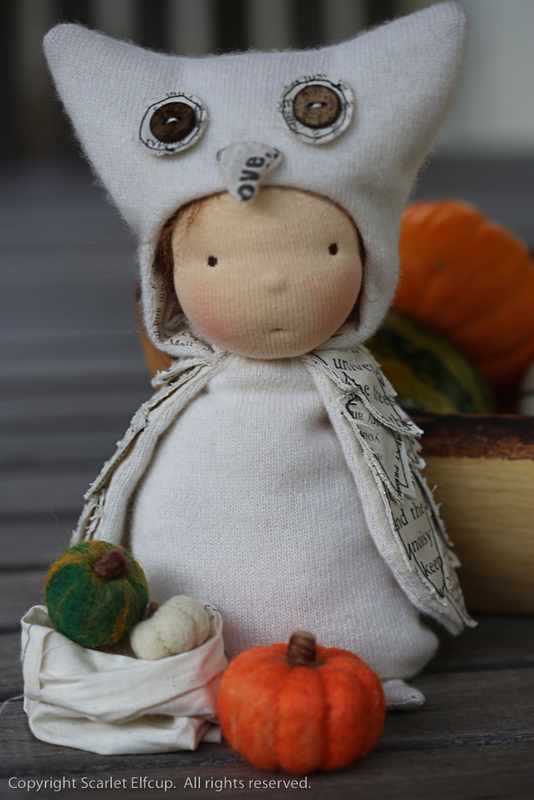 Carmina's ears, hands and feet are lined with a beautiful 100% Japanese Echino cotton linen fabric. Carmina is stuffed with 100% clean carded wool. Her eyes and nose are embroidered with 100% cotton embroidery floss. Her arms and legs are string jointed and stabilized and strengthened with beautiful wooden crafted buttons. Carmina comes capped with an ultra-soft bunny bonnet. Her lovely 100% baby alpaca hat is hand knit with holes fitted just for her baby bunny ears to poke through. Carmina comes carrying on her back a basket filled with a single wooden egg. The basket measures a little over 2" (5 cm) in diameter and about 2" (5 cm) tall and is crocheted with a 100% merino wool yarn by Madeleine Tosh. 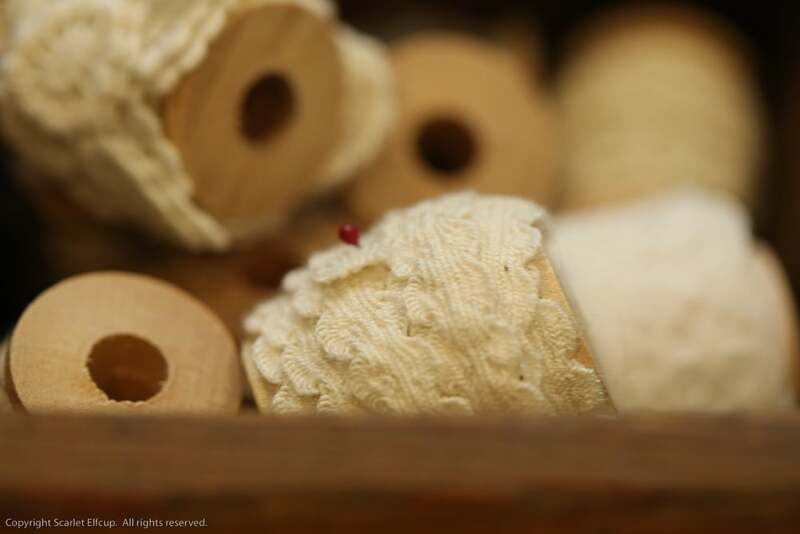 The straps are made of 100% linen ribbon. The wooden egg is made in Russia and measures 3" (7.6 cm) tall and 6" (15 cm) in circumference...so, about the size of an actual small egg. The egg is left unfinished and undecorated so that you may have the pleasure of painting and adorning it yourself on Easter. It is also hollowed inside...perfect for inserting a tiny surprise for your loved one on Easter. Toto measures 10" (25 cm) long. 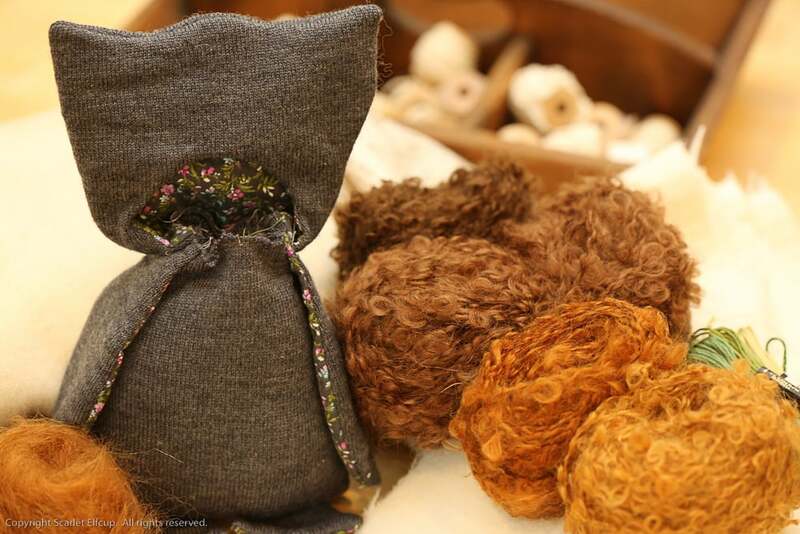 This sweet soft bear is made with all natural materials. Toto is made with clean, pre-washed, repurposed 100% merino wool. Toto's ears, hands and feet are lined with a lovely Liberty of London 100% cotton poplin fabric. Toto is stuffed with 100% clean carded wool. His eyes and nose are embroidered with 100% cotton embroidery floss. His arms and legs are string jointed and stabilized and strengthened with 100% coconut shell buttons. Toto comes capped with an ultra-soft bunny bonnet. His lovely 100% baby alpaca hat is hand knit with an Isager yarn and the ears are lined with the same fabric as that found on his ears, hands and feet. Toto lumbers along carrying a basket filled with three tiny wooden eggs. The basket is hand weaved using clean and treated pine-needles shed by the great Redwood trees found locally. The basket is weaved in the shape of an upside-downed bees nest for little bears love to dip their paws inside such nests when the sweet smell of honey is in the air. Inside the basket, strips of linen are used for straw. The three small wooden eggs each measure a little over 1" (2.5 cm) tall. The trio of unfinished wooden eggs are perfect for decorating to your heart's desire come Easter. Pebbles measures approximately 8" (20 cm) long. 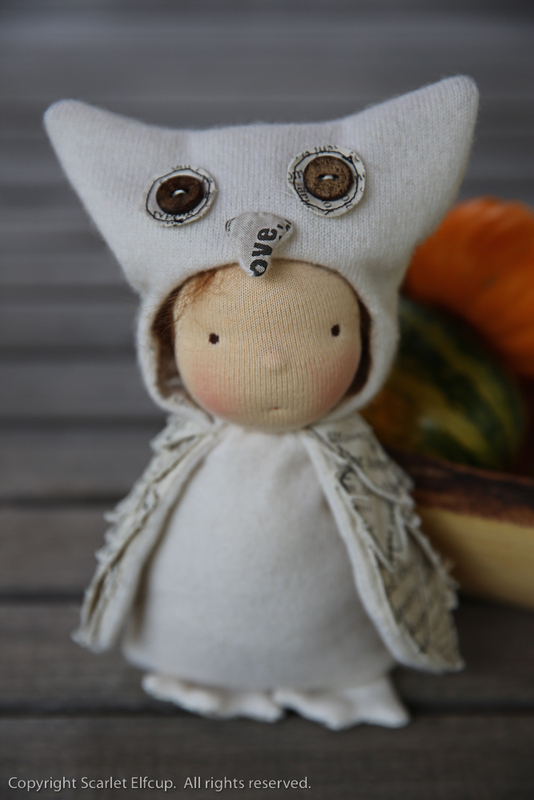 This simply chic bunny is made with all natural materials. Pebbles is made with 100% cotton linen. 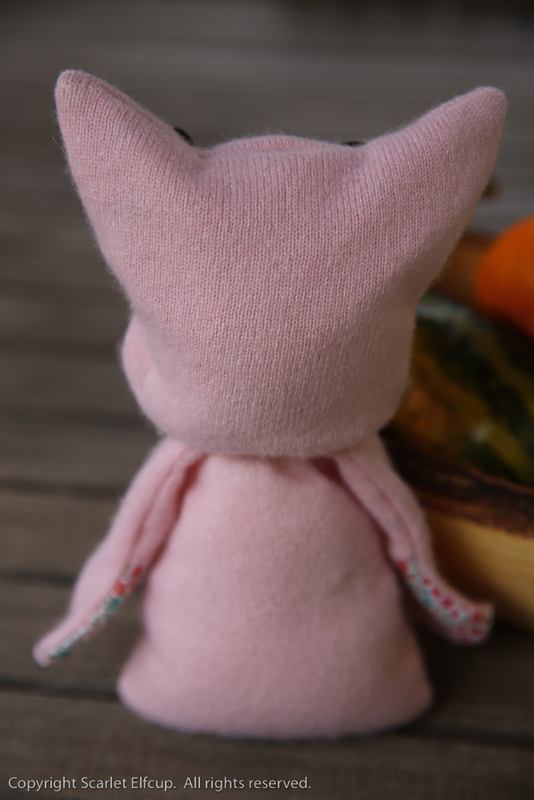 Pebbles' ears, hands and feet are lined with a beautiful 100% Japanese cotton linen fabric. Pebbles is stuffed with 100% clean carded wool. Her eyes and nose are embroidered with 100% cotton embroidery floss. Her cheeks are blushed with red beeswax. Her arms and legs are string jointed and stabilized and strengthened with beautiful wooden crafted buttons. Pebbles comes wearing a smart bunny bonnet. Her sweet pink cap is hand knit with mohair, silk and merino wool yarn and an opening made just to fit her wee bunny lobes. Pebbles comes carrying on her back a basket filled with a single wooden egg. The basket measures a little over 2" (5 cm) in diameter and about 2" (5 cm) tall and is crocheted with a 100% cotton yarn. The straps are made from ric-rac. The wooden egg measures 3" (7.6 cm) tall and 6" (15 cm) in circumference...so, about the size of an actual small egg. The egg is left unadorned so that you may have the pleasure of painting and decorating it to your heart's delight. And the hollowed inside is perfect for sneaking a special note or treat inside for your loved one. IMPORTANT NOTE: Kordee, Carmina, Toto, and Pebbles are recommended for ages 5+ due to the delicate nature of their design. Their string jointed limbs will not withstand rough play. And the small parts on them pose as choking hazards for very young children. They are not intended for children who still mouth their toys. If you are interested in giving these Spring bears and Spring bunnies a loving home to go to for Easter, they are now available in the Etsy shop. ALAS! Welcome to the world, Wisegrey! As I spent the month of January tending to many things within and beyond my workshop, this little owl sat in perfect patience waiting for his turn to awaken so that he may gather his "five-pound note, a small guitar and a honey jar" to begin on his journey of "a year and a day" across the seas with his sweetheart in search of their ring. Without further ado, let me introduce to you a young, grey and wise little soul. If you were around last Fall, you might remember a young kitty by the name of Margaux. Wisegrey came into the world for Margaux. So, soon...very soon these two shall set sail to the place where they will "dine on mince and slices of quince" and "dance by the light of the moon." Ah...swoon! Wisegrey and Margaux are inspired by Scarlet Elfcup's "The Owl and the Pussycat" playset, created back in September of 2014. Margaux went home to her mama long ago and she's been patiently waiting for the arrival of her little owl. To read more about the inspiration behind the making of Wisegrey, you must read the "Words of Wisdom." So, here he is...Wisegrey! Surely, you must be able to guess how he got his name. I needn't say more than the fact that his beautiful grey suit and the words of wisdom he carries in his hat and on his sleeve speaks for themselves. Little Wisegrey can doctor the grayest of days with words of comfort and wisdom, which he always carries under his hood and on his sleeves. Who wouldn't want such a wise sweet boy nearby always? Wisegrey is an 8" (20 cm) doll, made with natural materials. His facial skin is made with premium quality swiss cotton jersey and his body/bodysuit is composed of ultra-soft, clean, repurposed 100% cashmere. 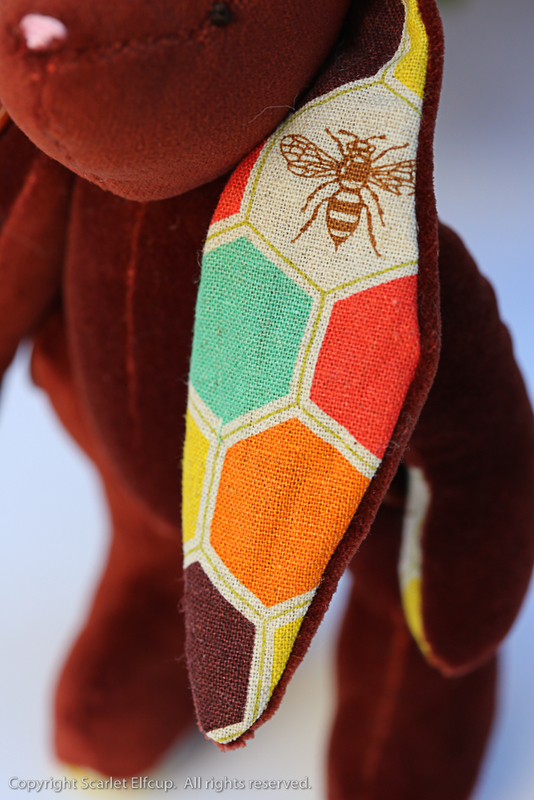 He is softly stuffed with bio-wool and weighted with non-toxic, washable stuffing beads. His owl bodysuit is permanently sewn on, but his hat is remove-able to reveal a sweet head full of ginger-brown hair. His hair is made of mohair yarn. His owl hat has buttons for the eyes and a piece of printed fabric for the nose. He has an embroidered and simple, expressionless face. His cheeks and nose are blushed with red beeswax. 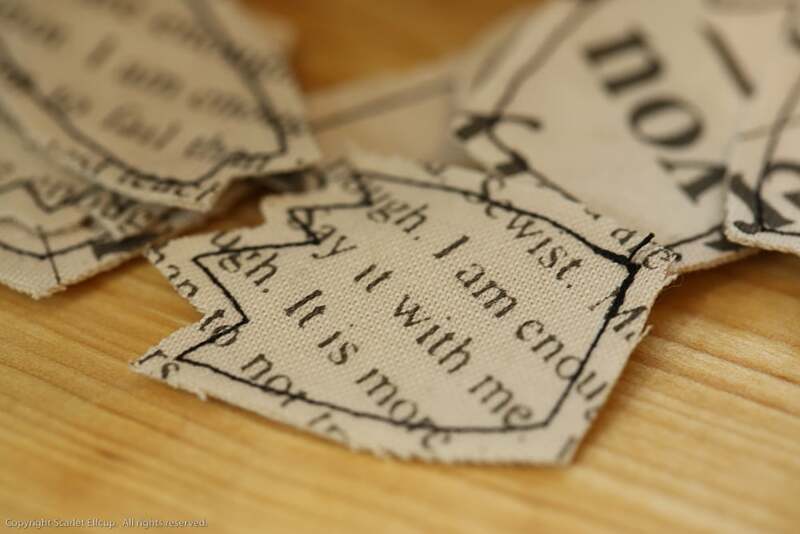 His wings are embellished with beautiful and inspiring words of wisdom cut from individually-shaped fabrics sewn and then stitched to the wing. His feet are lined on one side with this beautiful printed fabric. Wisegrey comes with his sweet guitar made of 100% cotton from a gorgeous vintage Owl and Pussycat fabric. The guitar is stuffed with 100% clean carded wool and measures about 6 in. (15 cm) long. IMPORTANT NOTE: Wisegrey is recommended for ages 8+ due to the delicate nature of his design and the small parts on him that pose as choking hazards for very young children. Coming November 1st!....a few of my favorite things....cute, cuddliness made of cashmere, wool, Liberty fabric and Japanese yarn. Hello friends! 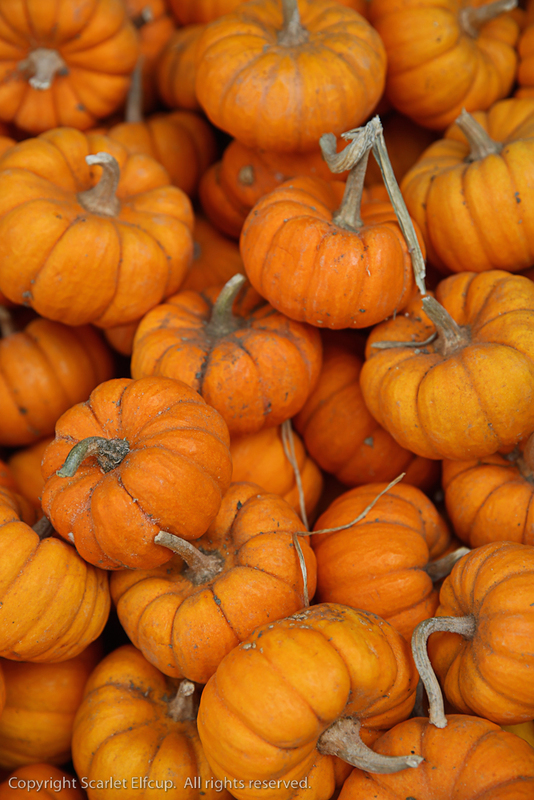 I am so thrilled that Fall is almost here! 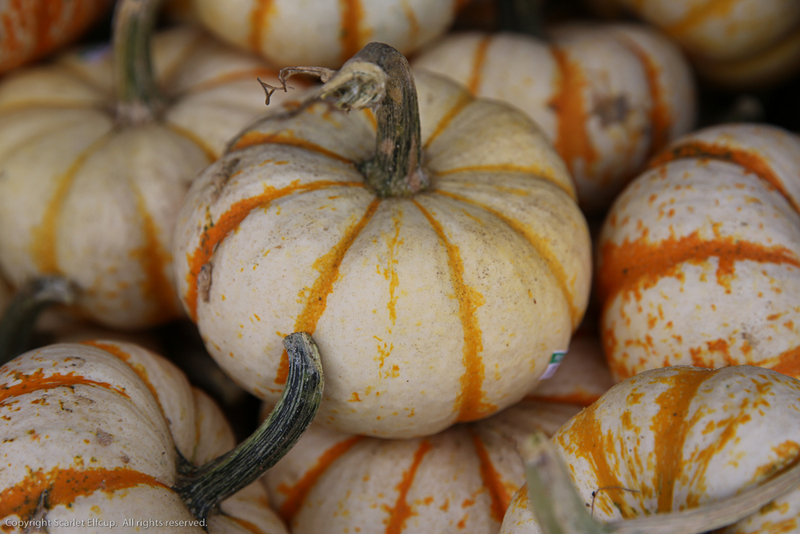 It is, for our family, the most favorite time of year...a time when the seasons change (yes, even here in California...even here, the leaves change colors and the air gets ever more blustery and there are pumpkins and falling leaves and acorns and the smell of spice all around). At our house, it is also a time to celebrate many things...birthdays, family visits, ethnic traditions, holidays. It is indeed the most hectic and fun time of year for us. Now that Summer is coming to a close and Fall is rolling near, Scarlet Elfcup's workshop will once again come to life. Even with the passing weeks, one by one critters and dolls have begun to make a lot of noise, tugging and calling for attention, asking and begging to be brought to life. All summer long they have been sitting idle, quietly and patiently waiting in their heaps of fibers, doll skins, fabrics. Now, it's their time for play! 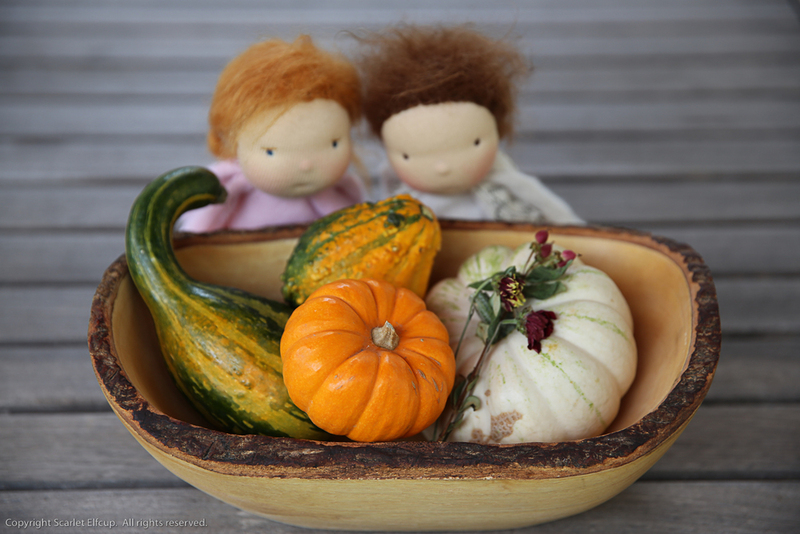 In a couple more weeks, some Fall critters will be showing their faces and one or two 6" Wee-Bee Mini Elfcups will be here for a special Ethnic celebration. So, stay tuned! They were found this morning on our doorstep...a basket filled with shy little baby animals (Softlings, they're called)...bunnies, kitties, mousies, bears and even a couple of elephants. We're not sure where they came from, where their mamas are or why they were left all alone at the doorstep of our house. We picked them up with a lot of care and transported them inside where they chittered and chattered in a language we could not understand. They warmed up to us after some time. And they even let us hold them. They are soft...soft as cashmere and fine merino wool...hence, the name Softling. Their bodies are extra floppy and slouchy when they sit in our hands. And they are playful! They love to be held and hugged, especially by little hands and arms. They seem to take to young children, but they also tolerate the adults just so. We were so taken by all of their personalities that we ended up giving each one a name of their own. These Softlings are handmade from clean re-purposed 100% cashmere, wool, and cashmere/silk blend and softly stuffed with clean carded wool. 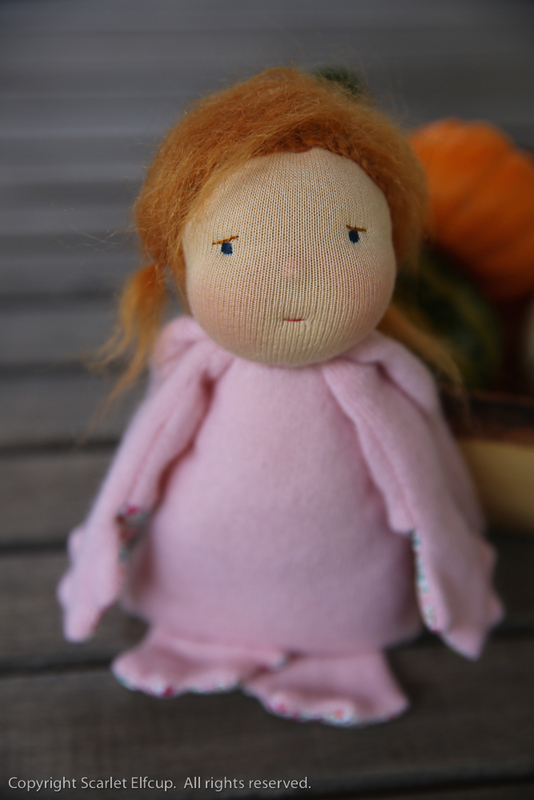 The doll skin is made of European imported 100% cotton jersey. The ears are lined with cotton fabric. Facial features are embroidered with cotton embroidery floss. They measure about 7.5" tall and 6" wide. The Softlings are now available for purchase in the Etsy Shop. 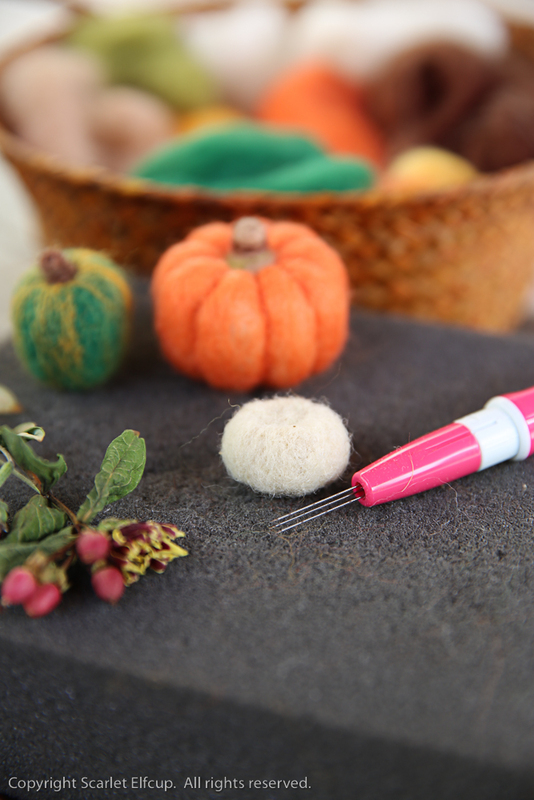 IMPORTANT NOTE: The small and delicate parts on the Softlings are not suited for children under the age of three.